View exhibitions in the Archives & Special Collections reading room and hallway exhibit cases. Learn what’s happening in the Library now, or find out more about using our materials in the classroom. As part of MPS507, a 3rd year Ryerson University Image Arts class in The Photographic Book, students conceive of, and create their own photobook. This is, in part, related to work that has been completed in the co-requisite class, MPS506 – Photographic Production. These are both required courses for the Bachelor of Fine Arts (Image Arts) Photography Studies Option. 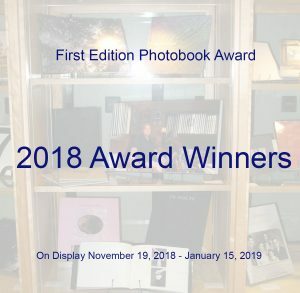 Each year, the Library purchases the top photobooks in the class from the creator. The books are judged at the First Edition Photobook Show – an exhibition of the photobooks at the end of the semester. The library catalogues each book, and houses them in the Special Collections department, where they will be available for students and researchers. Extending the celebration! 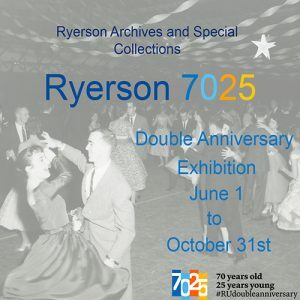 Ryerson celebrates a very special anniversary this year – 70 years since the school’s founding and 25 years since it achieved full university status. Come by the reading room and take a look at our exhibition about Student Residences and Sports and Recreation at Ryerson.